Wipe the mushrooms clean. Remove the stems carefully so that the tops remain whole. Chop the stems and add them to the veal mince. Pre-heat the oven to 180°C (375°F). Peel the shallots and chop them finely. Finely chop the bacon. Mix the shallots, bacon, parsley, crushed garlic, salt, pepper and tomato purée into the veal mince. Melt half of the butter and fry the veal mince mixture in it for about 10 minutes, stirring. In the meantime, divide the broccoli into florets. Peel and wash the potato and dice it. Boil the broccoli and potato cubes for 12 minutes. Pour boiling water over the tomato, peel it and cut the flesh into small cubes. Mix 2 tbsp. of breadcrumbs with 1 tbs of grated cheese and mix this into the veal mince. Fill the mushrooms with the mince. Grease an oven dish with the rest of the butter. Place the stuffed mushrooms in the centre of the pre-heated oven for 10-15 minutes. In the meantime, purée the cooked broccoli and potato. Mix in the rest of the cheese and add salt and pepper to taste. 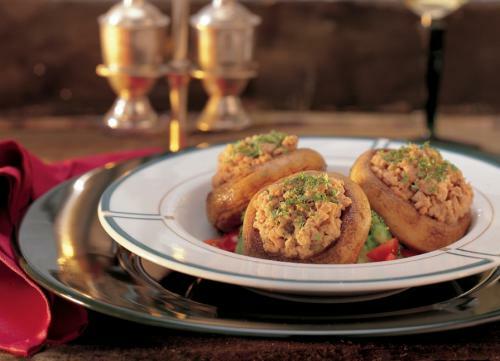 Serve the stuffed mushrooms on a bed of puréed vegetables and tomato cubes. Tips: * Serve with a herb cream by mixing crême fraîche or sour cream with fresh green herbs.